Ever since the International Human Genome Project achieved its extraordinary goal of sequencing and mapping the entire human genome, represented by approximately 3 billion base pairs, with its far-reaching implications for understanding the causes of human genetic disorders and their diagnosis, progress in the field has not slowed down. 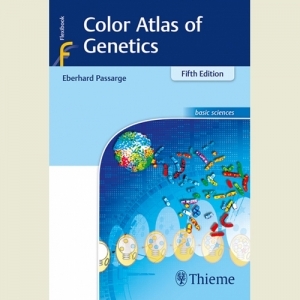 In the fifth edition of the bestselling Color Atlas of Genetics, readers will be rewarded with a complete and current overview of the field, with an emphasis on the interface between fundamental principles and practical applications in medicine and the role of signaling pathways in causing diseases. Using the acclaimed Flexibook format designed for easy visual learning and retention, the atlas is invaluable for students, clinicians, and scientists interested in staying up to date in this fast-evolving area. With almost 200 stunning color plates explained by concise texts on the opposite pages, including tables presenting useful data, a glossary of terms, key references, and online resources, the atlas presents clear and accessible concepts. It is an excellent refresher for investigators in any field of medicine or biology.